Do people talk about dogs or cats more on blogs? Search blogs — discover who’s discussing what, where, when and how. Trendpedia finds trends in social media. You choose the topics, enter the keywords, and click “Search Trend”. 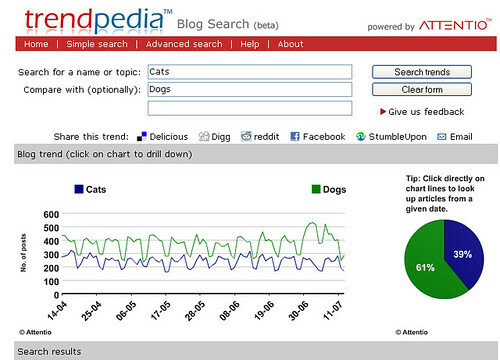 Trendpedia finds the articles online that talk about your topics. Trendpedia organizes the articles in a trendline that shows the popularity of the topic over time — you can track a topic’s trendline from three months ago up to today. Trendpedia collects posts about your topic per day. Click on the trendlines to find the articles about your topic posted on the date of choice. Watch the articles appear in the tabs below, organised according to topic and date. How might you use an analytics tool like this to evaluate your social media strategy? Last year, I went to a podcamp session about using Web 2.0 to do political organizing. The person leading the session said, with some distaste, that YouTube was overrun with videos of "cats flushing the toilet by themselves." And I thought, "Like that's a bad thing?" Fun graph! But I'd use them with some caution. It would be interesting to see a break down of the stats into categories of usage. For example, is someone truly blogging about dogs when they use the word to describe something in a pejorative manner? For example, "Baseball has gone to the dogs." Perhaps people write about cats and dogs equally but take dogs names in vain more often? I dunno. On the other hand, I wonder how the chart would change if a major sequel to the musical "Cats" came out next week. Beth, I discovered this blog thanks to the speaker list for BlogHer. I will be Back!! AtomicIQ presents charts and numerical data for blogs, YouTube, and mainstream news results. -- You can export the data to a spreadsheet and work with it offline. -- You can filter or “divide” these results by a second query. The filtering and “dividing” controls are relatively new to the search world. They can be used in different ways. For example, they allow a marketer to see which mobile phone maker is most associated with “3G” or “touch screen”. It's free to use, so feel free to give it a whirl and any feedback is always welcome.